A couple weeks ago I asked if Do You Report Your Competitors as Spam in Google? Well, the results are in and most SEOs said they do not report their competitors to Google as spamming. 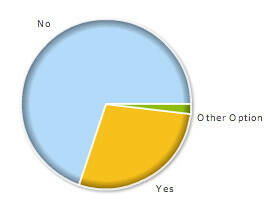 Of the 159 responses, 111 respondents or 70% said no, they do not report competitors to Google. 45 respondents or 28% said they do report competitors to Google. While three of those votes were for "other" but was actually left blank. I am actually a bit surprised by the results, I would have thought more SEOs would anonymously say that they do report competitors to Google. These results, to me, shows a fairly strong unity amongst the SEO industry. Previous story: Google Is On My Site! Will I Be Penalized Soon?